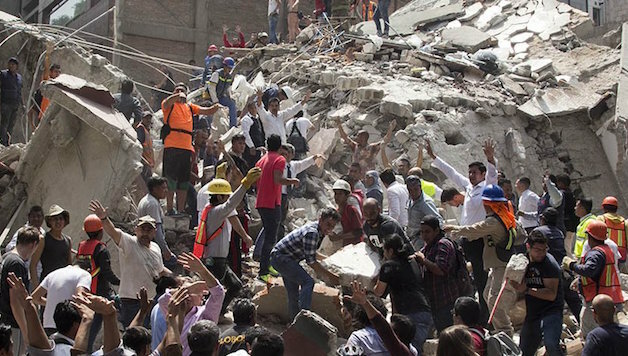 Morelos, Puebla and Mexico City suffered the worst effects of an earthquake measuring 7.1, with the epicenter in Alxochiapan, Morelos. More than 130 are dead, adding to the terrible earthquake that claimed the lives of at least 90 people in Oaxaca and Chiapas, a little more than a week ago. For such a human catastrophe to occur is not just due to natural causes but also because of vulnerability, i.e. the poor conditions of school buildings, poorly paid jobs and bad working conditions, poor housing, and the lack of city planning for earthquakes. Construction regulations for schools, hospitals and homes are simply ignored in order to make more profits for construction companies. Unfortunately this is the situation facing the majority of Mexicans, who live in places predisposed to natural catastrophes which are often aggravated by poor living conditions. Even so, it is the majority of the population, the most affected by the earthquakes, who take to the streets in the rescue efforts, collaborating in solidarity, and contributing resources: human chains they clear away debris, people provide rescue tools and bring food. People report on the catastrophe and ensure it is widely known about what is needed. The majority understand that if it is not ourselves who acts, we will not be able to recover from a catastrophe like this. The labor exploitation that prevents interruption of work when it is necessary to leave the workplace and save lives, the intense control in schools in which turnstiles operate, the priority of protecting private property with metal bars and fences, etc. which hinder free passage, and the corruption that means building materials are not properly used, are just some of the reasons why people are so vulnerable, particularly in overcrowded Mexico City (a product of internal migration due to a lack of job and studying opportunities in the provinces). Those most responsible therefore for the outcome of the earthquake disaster are those who have the least moral authority – the governors, the representatives of the state, today and in the past. In the face of catastrophic events in the cities and towns, they bear main responsibility for the great vulnerability in which millions live. The latest earthquake has shown, once again, the inability of the state to respond in a timely way. The army arrived at a collapsed textile factory, on Bolivar Street, in downtown Mexico City, 12 hours after the event took place. The authorities’ priorities are also clear. They attended first to earthquake damaged parts of wealthy neighbourhoods like Polanco, La Condesa and La Roma, in Mexico City. But there was extensive damage beyond the areas where wealthy people live where popular efforts to rescue and clear up began to appear. The effects of the earthquake and lack of intervention by the authorities in other states means people are living under fallen buildings and electricity blackouts affect 3.8 million people. The lack of street lighting means crime is a real threat, especially where patrols do not operate. The most remote regions, such as Tlahúac and Xochimilco, have received no support at all. No matter how much the politicians and authorities use photo opportunities to show their crocodile tears, the rottenness of the government and the greed of the big companies, are starkly highlighted during disasters such as the earthquake. Organising popular brigades and medicine collections. Only the people can save the people! Let us organize the rescue, solidarity and reconstruction of a new society!